Like many fans, I paper over the slow stretches in TV’s scheduling cycle with binges. The adults in my house have kids and jobs, so those binges aren’t stay-up-all-night marathons—just two or three episodes whenever our night isn’t taken up by sports or movies, getting through a season in a few weeks, and then wishing there were more Good Fight or Marvelous Mrs. Maisel or Broadchurch right away. There’s been lots of discussion, in the context of our new streaming habits, about what freedom from scheduling considerations has done to the concept of “the episode”—how they’ve become variable in length (sometimes extra long for no apparent reason) and parsimonious with plot (stretching out what once might have been 40 minutes worth of incident over multiple hours). But not as much attention has been paid to what bingeing has done to the time in between those episodes. What does it mean, when we have gotten used to carving another slab of cake as soon as the last one disappears, to wait? It’s been more than a year since the explosive last episodes of season three: Kim’s car accident, Jimmy’s sabotage of the Sandpiper settlement, Nacho’s attempt on Hector’s life, Chuck’s death in a house fire. We’ve had plenty of time—too much time!—to sit with those events, think and talk them over, speculate about what comes next, process, destress, accept the changed world that would arrive with the season four premiere. But as soon as the cold open’s black-and-white gives way to early 2000’s Albuquerque in color, we’re back in the immediate aftermath of those wild, violent, game-changing events. None of the characters have had months to recover. In fact, the A-story of this episode is “Jimmy learns about Chuck’s death, tries to figure out how to deal with it.” That’s it. Future viewers streaming the series will jump straight from “Lantern” to “Smoke”—effect immediately following cause in Newtonian fashion—and process the chaos of season three’s end alongside Jimmy and Kim and Howard, in their timeframe. Here in the world of waiting, Jimmy’s immobility and silence strike us entirely differently. “Smoke” is a reminder of how much has changed, and yet how far we have to go. Slow down, it says. This is a big deal. Jimmy begins this episode in a chipper can-do mood: He’s persuaded Kim to give up their offices and work from home, and his role in the partnership is getting up early to make the coffee and support her, while looking for job opportunities so he can contribute financially as well. This is the socially acceptable side of “hustle”—the hard work side. And for all of Jimmy’s attraction to the other, exploitative side, he’s never cut those corners because he’s lazy. That’s one thing that Chuck could never understand, because for him, discipline meant boundaries as much as it meant dedicated practice. Faced with the shell of Chuck’s immolated house, but even moreso with the knowledge that Chuck did this to himself, and was pushed to it by something drastic, Jimmy shuts down. The key image, and an extraordinarily graceful one, is Jimmy still awake with the bottle of tequila in front of him in the morning light, Kim asleep on the couch beside him; her determination to support him is no match for his guilt. Mike gets by far the most fun sequence, riding around on a Madrigal golf cart with a stolen ID, noting deviations from warehouse protocol. 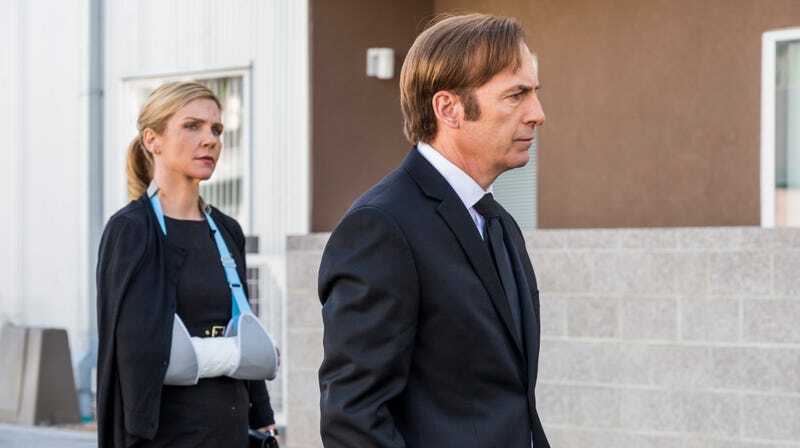 (Note to AMC: Ditch Talking Saul and replace it with half an hour of Mike issuing security demerits like a worn-out Gordon Ramsay or avuncular Anthony Melchiorri.) He’s not willing to just cash Lydia’s check; he’s determined to act the part of her security consultant—and pick up a lot of useful inside information about how Madrigal operates in the process. We pick up Nacho right where we left him, too, with Hector stroking out and his fake pills switched back for real ones. All that’s left is for Nacho to get rid of the evidence—but before he can drop them down a grate in the warehouse yard, Borsa calls in the troops to dictate that the Salamanca business will keep running just as it did under Hector. Gus gives a more realistic assessment: underlings and rivals will start a war for control of the territory, and that will bring the DEA down on everyone. Nobody’s motivations change here, unlike in the A-story, but Nacho starts to consider the aftermath of his desperate act for the first time, while Gus is thinking about how to leverage what he just witnessed. 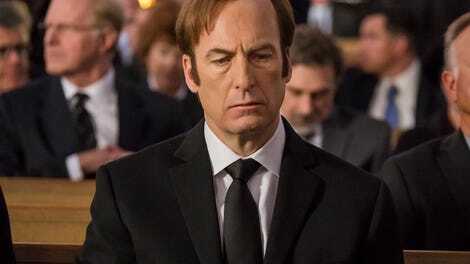 One throughline connecting Slippin’ Jimmy to Saul Goodman is Jimmy McGill’s need to absolve himself of blame. It’s okay to fleece marks because really, they’re doing it to themselves. And in the final scene of “Smoke,” Jimmy comes back to life when Howard agonizes over forcing Chuck out of the firm, suspecting that it’s what precipitated the relapse and suicide. “Well, Howard,” he announces without a shred of empathy, “I guess that’s your cross to bear.” Feed the fish, make the coffee, whistle a happy tune; Jimmy’s just shifted the cross of Chuck onto someone else’s back once and for all, and he feels light as a feather. But in his future is a collapse on a Cinnabon floor, a gurney and machines like the ones that tortured his brother, and the threat that follows him everywhere—discovery, exposure, the past. A cross nobody else can bear—and that he can’t ever put down. The music in the cold open is the Ink Spots, “We Three (My Echo, My Shadow, And Me),” a song about loneliness—and yes, waiting. And speaking of that cold open, I was struck by Jimmy’s isolation. In Albuquerque he has an intimate relationship with Kim, and could sometimes even tell the truth or bare his soul to Chuck (although it was almost always a bad idea). Now in Omaha, he can never reveal himself or be himself to anyone… ever again. It’s always seemed, to me, the most chilling part of any story about abandoning your identity and taking on a new one. Hanging from the taxi’s rearview mirror, underneath the driver’s eyes staring at his passenger as if he knows him, is an Albuquerque Isotopes air freshener. (Gotta be unnerving to see that in Omaha.) Later (or, of course, much earlier), Mike watches the Isotopes game on TV while contemplating his new job. For those of you looking for a timeline, the Calgary Cannons moved to Albuquerque and became the Isotopes starting in the 2003 season. “That’s the Pacific Northwest, right?” asks the hospital cashier about “Gene’s” 531 social security number prefix. Indeed it is—Washington State, to be precise. On the phone with Jimmy, Howard recites Chuck’s obituary like oratory, putting down his notes and declaiming, with feeling, from memory. There’s no sign of guilt yet, only sincere admiration for his partner, and maybe, in the back of his mind, some consideration of how he himself would like to be memorialized someday. (Charles Lindbergh McGill graduated high school at age 14!). But Jimmy takes that list of accomplishments as he’s always taken Chuck’s very existence: as a personal rebuke.